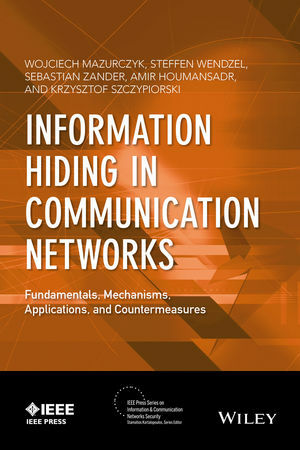 Describes Information Hiding in communication networks, and highlights their important issues, challenges, trends, and applications. Wojciech Mazurczyk is an Associate Professor at the Institute of Telecommunications, Faculty of Electronics and Information Technology, Warsaw University, Poland. He is also a senior member of IEEE. Steffen Wendzel is Head of Secure Building Automation at the Fraunhofer Institute for Communication, Information Processing, and Ergonomics (FKIE) in Bonn, Germany. Sebastian Zander is a Lecturer at the School of Engineering and Information Technology, Murdoch University, Australia. Amir Houmansadr is an Assistant Professor within the College of Information and Computer Sciences at the University of Massachusetts Amherst. Krzysztof Szczypiorski is a Professor of Telecommunications at the Institute of Telecommunications, Faculty of Electronics and Information Technology at Warsaw University of Technology, Poland.